Climate information value chains: pathways to greater use of climate information in African decision-making? The city of Cape Town, where I live, has experienced consecutive droughts, which have led to acute low dam levels and the institution of extreme water saving measures to avoid severe water shortages. The city may have to implement water cuts before the next rainy season. Information about historical, present and future climate, usually referred to as “climate information”, can inform users like the city of Cape Town’s water planners and managers to prepare for and manage the effects of extreme climatic events, such as drought, and long-term climatic changes. 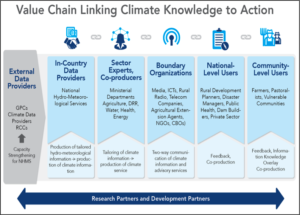 The process that delivers climate information to users can be conceptualised in the form of a climate information value chain as done by the World Meteorological Organization (WMO) in figure 1. The value chain is an idealised model of the value creation process, starting with the generation and provision of weather and climate data, and ending with improved decision-making by different types of users. Ideally, if value chains operate well, then investments in producing climate information will result in societal benefits, such as improved preparedness to extreme climatic events in Cape Town. If they do not work well, the usefulness and value of climate information decreases, and we could see more failures to prepare for impending climate-induced disasters. It is important to understand how climate information value chains might ideally function in theory, and how they function in practice. This allows us to improve value chains for societal benefit. In many cases however, value chains do not yet exist. Where they exist, key links in the chain may be weak or broken and where they are taking shape, there are disputes about how they should function. At a recent Future Climate For Africa (FCFA) conference, attendees grappled with the functioning of value chains. Of particular interest was how to develop value chains appropriate to decision-making in a wide array of African contexts. Central to this discussion is debate over the different functions that various actors perform, or should perform, along the value chain. One attendee questioned the role of climate scientists and universities: “Should we be doing more to tailor, and package climate information for particular uses and decisions?” I posed a similar question to climate scientists working in the water, sanitation and hygiene (WASH) sector in Zambia at another FCFA event in Lusaka. A climate scientist at a local University identified high teaching and administrative burdens at resource-constrained African Universities as a barrier to engaging more in user-targeted climate services. In another instance however, the University of Cape Town’s Climate Systems Analysis Group (CSAG) has an established record of providing service-oriented consulting to a wide range of clients. Given the appetite from some in academia to do more, what mechanisms can help overcome current barriers? National meteorological and hydrological services (NMHSs) across Africa have also shown an interest in expanding their service offering of traditional weather services and the collection of weather data and maintenance of national observation networks. However, in many instances capacity constraints impede them from providing new and novel climate services. At the first Africa Hydro-met forum in Addis Ababa, Ethiopia, a private sector actor insisted that NMHSs in Africa need to focus on data collection and sharing, where they have a competitive advantage, and allow the private sector to lead on the delivery of value-added climate services. A statement by directors of African NHMSs challenged this assertion, and emphasized the necessity of public private partnerships for development and delivery of effective climate services. International NGOs have also joined the growing number of actors seeking, translating, and delivering climate information, or piloting novel climate services, as part of humanitarian or development aid programmes. Whilst they often have significant expertise in delivering climate services, their operations are reliant on short-term project funding cycles and the sustainability of these business models are questionable. With such a diversity of actors and agendas, to what extent are partnerships key to unlocking enhanced performance of value chains? What roles are there for state and non-state actors within partnerships? In addition to uncertainty about roles and functions, the science on which the value chains rely is subject to live contestation within the expert community, and contains significant uncertainties. In Cape Town’s situation, it has been argued that seasonal climate forecasters were unable to provide an accurate forecast of the successive droughts. Forecasters also couldn’t agree on a consensus message to inform preemptive drought actions. The current state of the science complicates the development of effective climate services and the functioning of the value chain. In order to bridge the divide between the constraints of climate science and needs of users, the piloting of interactive, experimental, multi-stakeholder processes to generate and deliver climate information have been gaining popularity, with support from development aid programmes. Such “pilot” services are still largely experimental, potentially opening exciting new opportunities whilst also flagging risks: In some instances supporting significant advances in user-relevant science and services, in other instances showing limited immediate benefit whilst risking stakeholder fatigue and “extractive” practices. Researchers should be evaluating these processes critically for replicability, scalability and sustainability of implied climate information value chains. My experience has highlighted the importance of interrogating value chains and identifying sustainable and effective models for delivering climate services. This is particularly so in Africa where these value chains are often non-existent, yet desperately needed to manage climate change-related risks. FCFA and several other programmes provide a vibrant community of researchers, practitioners and users within which to continue this discussion. This blog was written by FCFA’s Nkulumo Zinyengere with contributions from Jean-Pierre Roux and Suzanne Carter. The blog is a first of a series that will explore the issue of climate information value chains in African contexts. To stay abreast of these and other FCFA outputs, sign up to our newsletter and follow us on twitter.